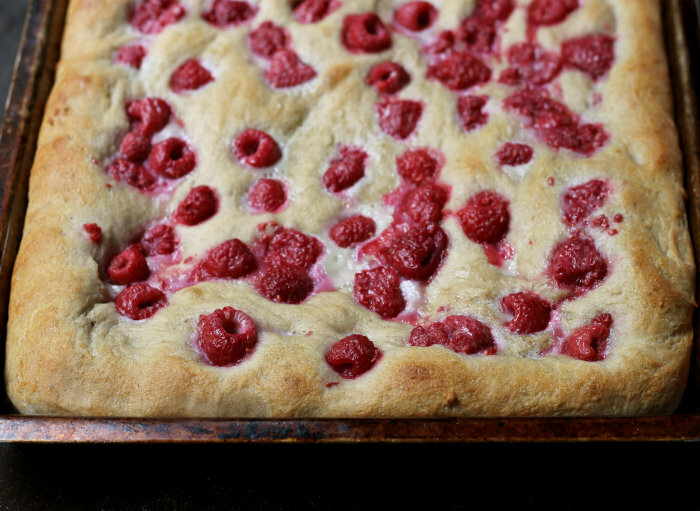 Focaccia topped with raspberries to give it a bit of sweetness and nice color. You know that I love my bread. Just look around my blog and you will find all kinds of bread recipes. My daughter had given me a cookbook maybe a couple of years ago. It’s all about baking; it has some great bread recipes. The focaccia looked wonderful in this cookbook, it was topped with basil, cherry tomatoes, and pancetta. But to tell the truth I am not quite sure if my family is quite ready for this type of bread, I thought I should ease them into something like this. So I turned to the web to see if there were any sweet versions of the focaccia and yes I did find some. 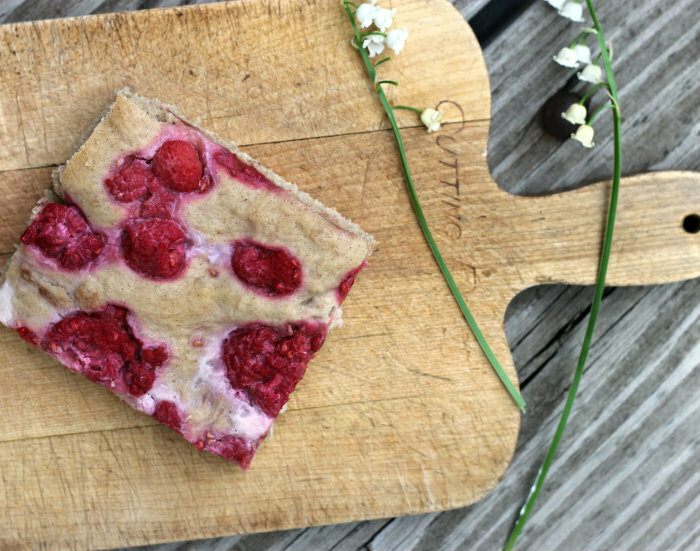 I thought my first attempt should be with berries on top of my focaccia. The first time I made it I used strawberries, it was yummy. But I did not spread the dough out as much as I should have and it was a thicker bread. When my daughter who has actually eaten focaccia before informed me that it is supposed to be more of a flat bread, so I went back to the drawing board and made it again. 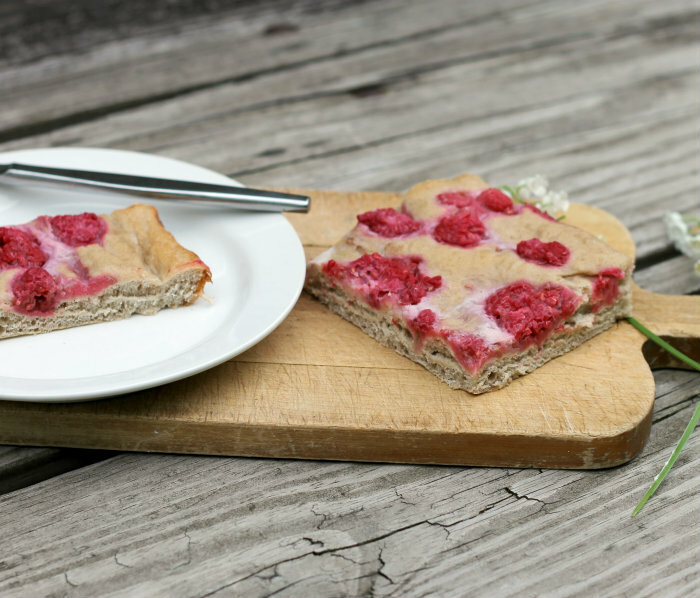 This time I made it with raspberries and I brushed it with an egg white, honey, and butter mixture before baking it. 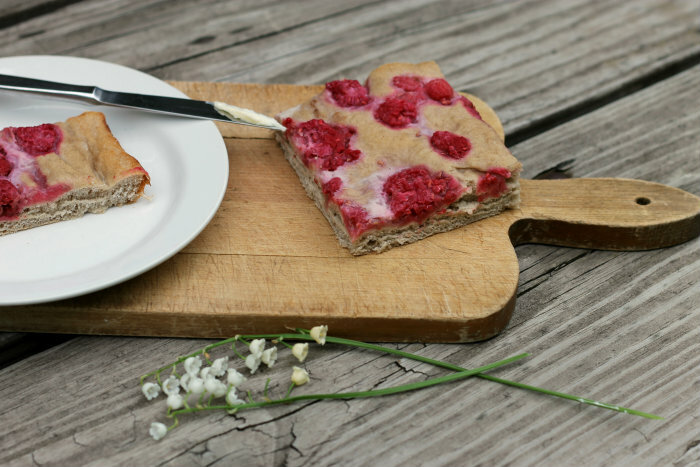 The bread turned out soft and the berries with the sweetened egg wash gave a hint of sweetness. I think I got it right this time. To a large bowl add the yeast, water, and brown sugar. Let it proof for about 10 minutes. Add the oil and mix in to the water mixture. Once the oil is added you will add 1 cup flour, salt, cinnamon and stir until this is combined. Gradually add the rest of the flour, kneading the dough as you add the flour until you have smooth and elastic dough. Grease the bottom of the bowl and turn once to coat both sides. Cover and set in a warm place for about an hour or until the dough is doubled in size. 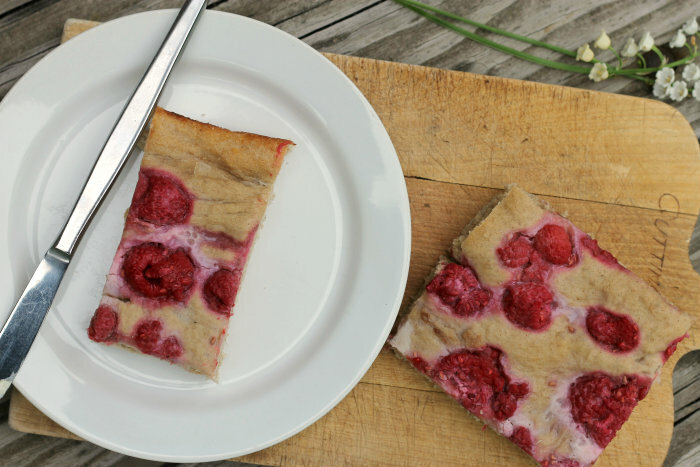 Just before the dough is ready to be placed on the baking sheet take the raspberries and toss them with a tablespoon of sugar. Make sure that they are rinsed and dried before tossing them with the sugar. To make the egg wash. Add the egg white to a medium bowl and whisk until starting to get frothy, add the melted butter and honey and whisk until they are mixed in. Once the dough is doubled in sized, place the dough into a greased baking dish (I used a jelly roll pan an 11 x 15) Pat the dough out so it covers the whole pan. Make indentations with your fingers. Place the berries over the top of the bread, I add them to where the indentations were. The brush it generously with the egg wash.
Bake it in an oven that has been preheated to 400 degrees F for 15 minutes or until the edges of the bread are turning brown. This focaccia looks so lovely for spring/summer! I love raspberries – very creative!